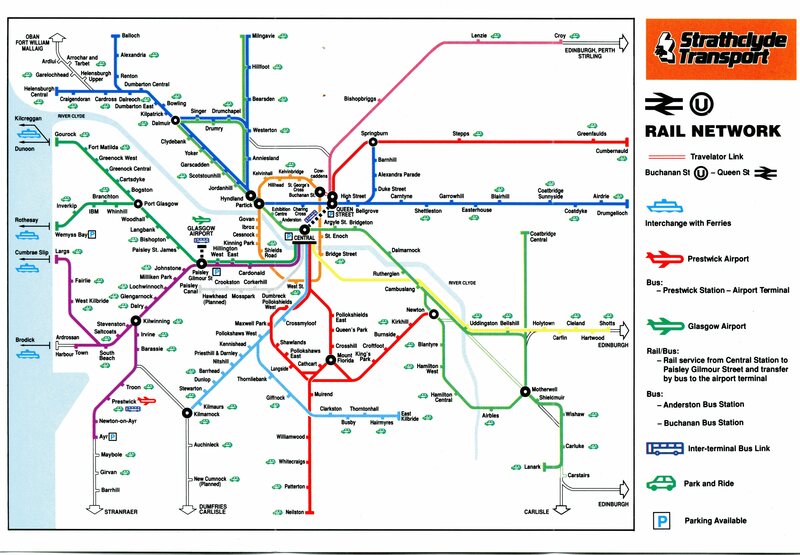 Looks like a 30º map, but there may be xy distortion too. 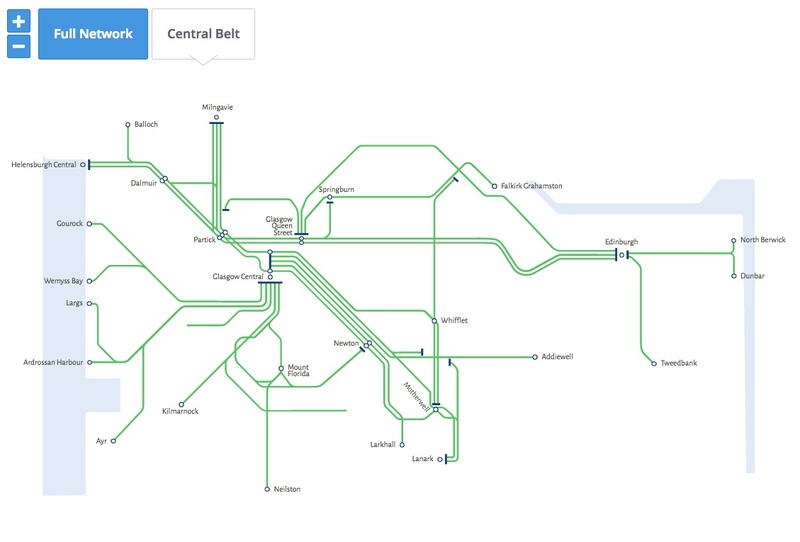 The central belt is simplified and the user has to refer to the Central Scotland map for detail in this area. 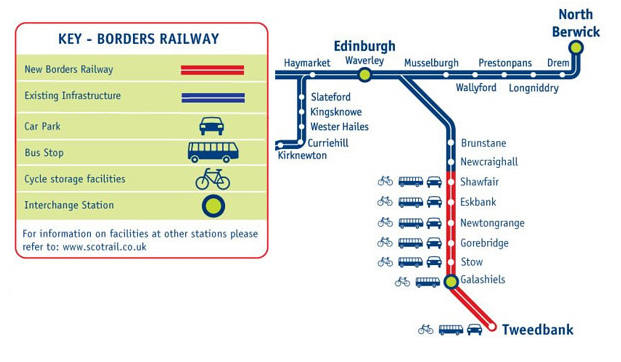 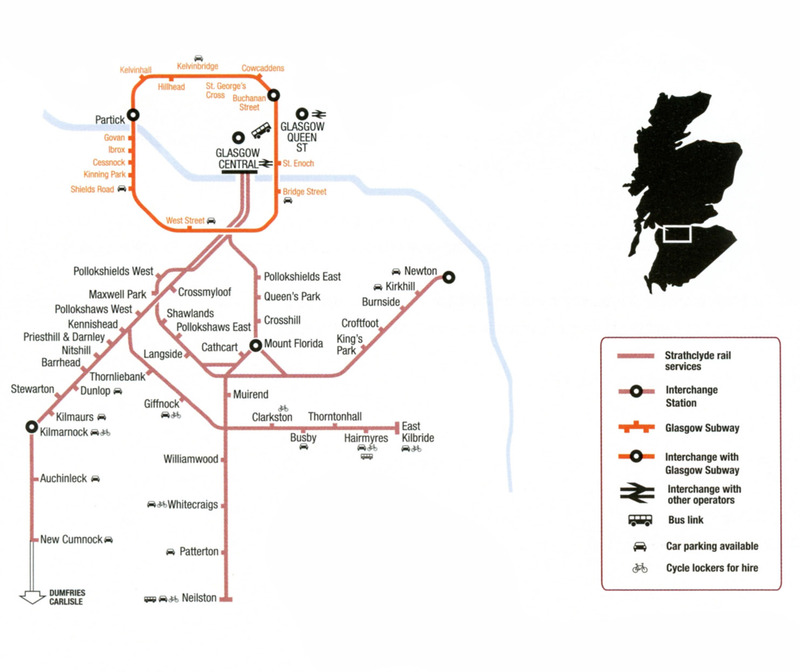 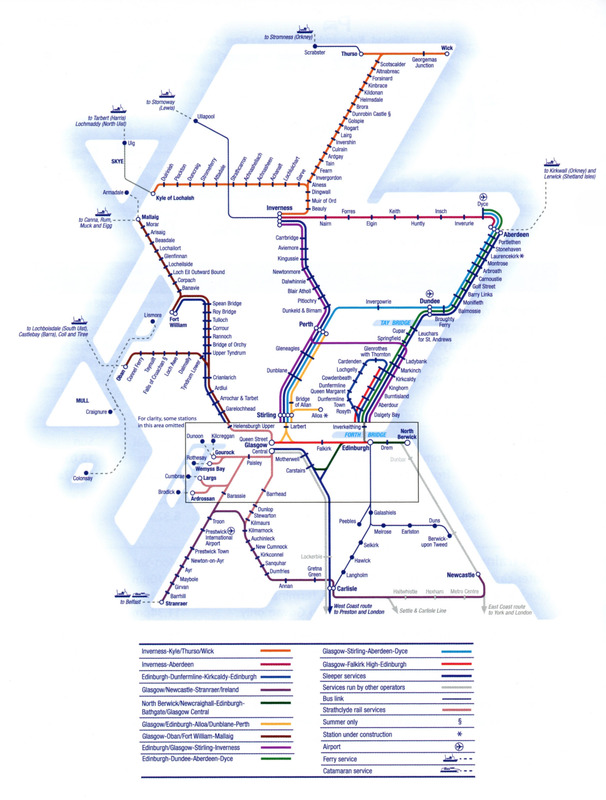 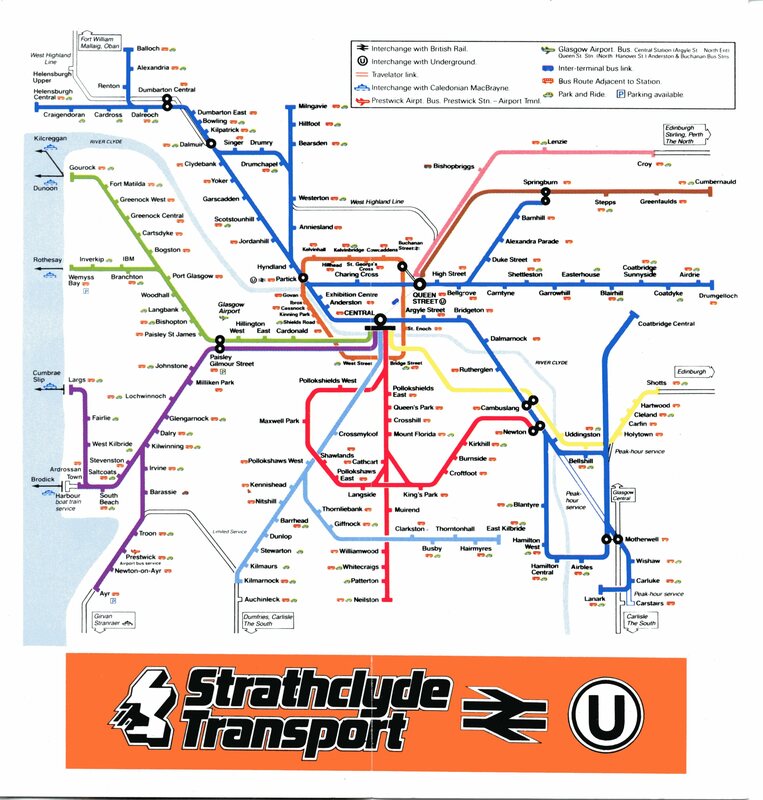 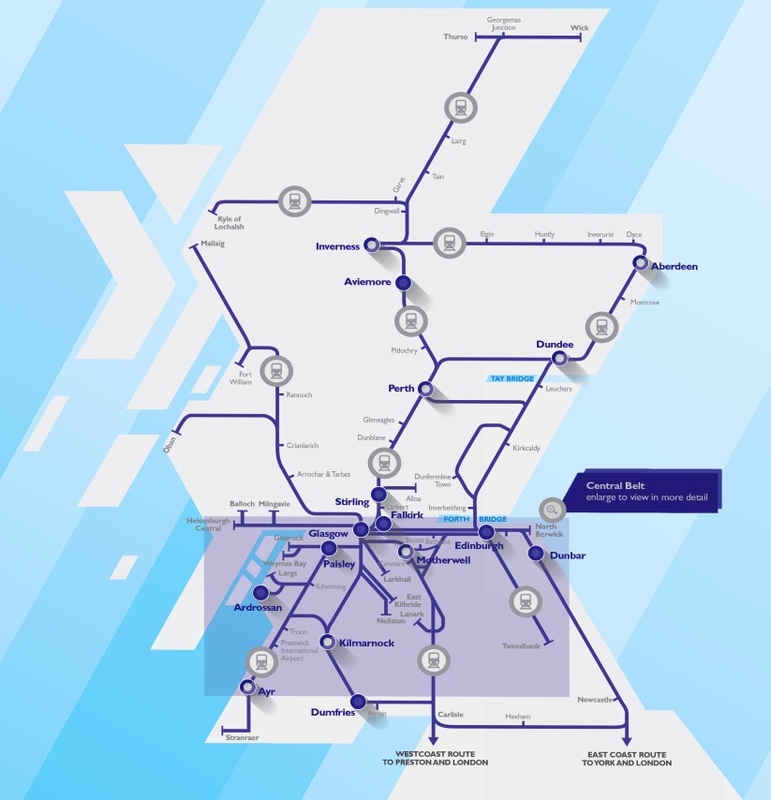 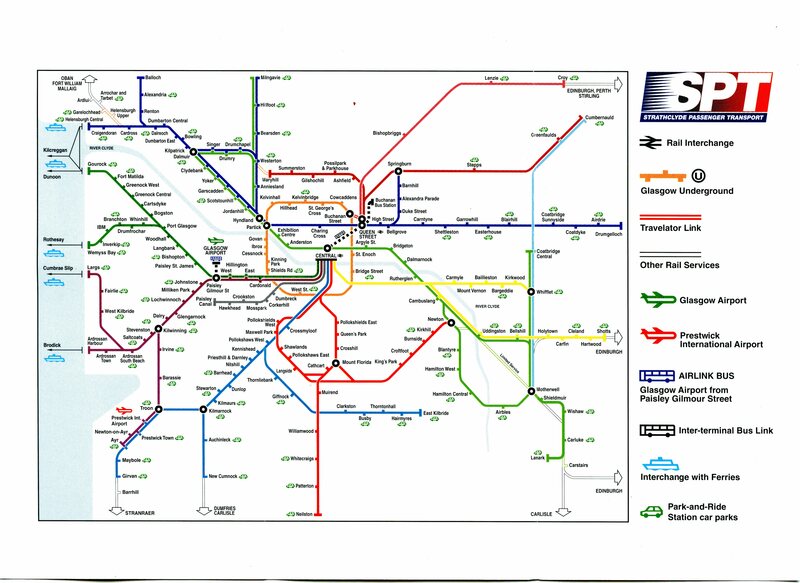 The maps do not share the same line angles or colour-coding - the Scotrail map suggest it runs trains to Strathclyde whereas the central map sugests not. 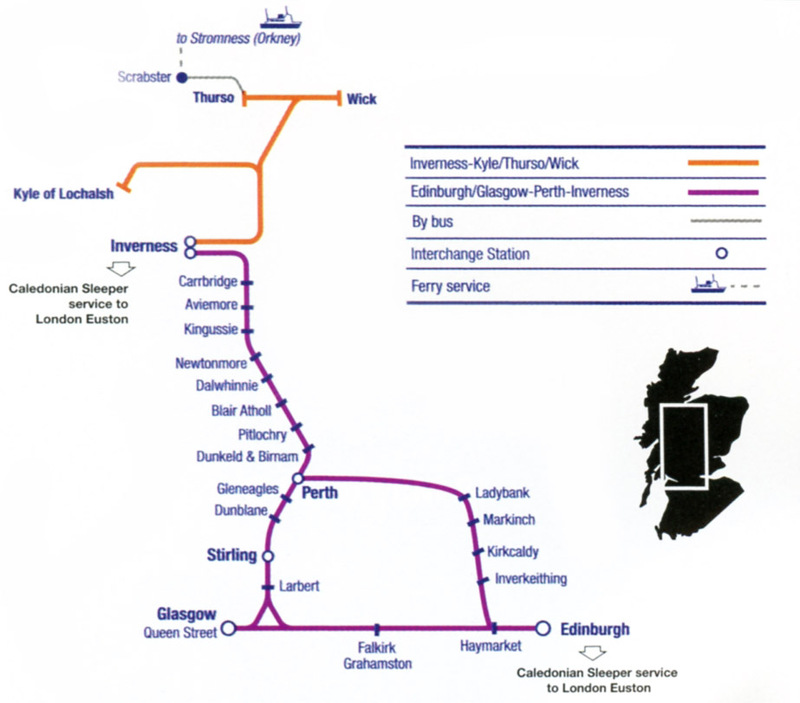 Slightly more effort could have been made in the relationship between routes and the coastline, putting Elgin at the mouth of the River Ness is inexplicable, and routes that roughly parallel the coast (to Dundee, to Aberdeen and to Thurso) are different distances from the coastline. 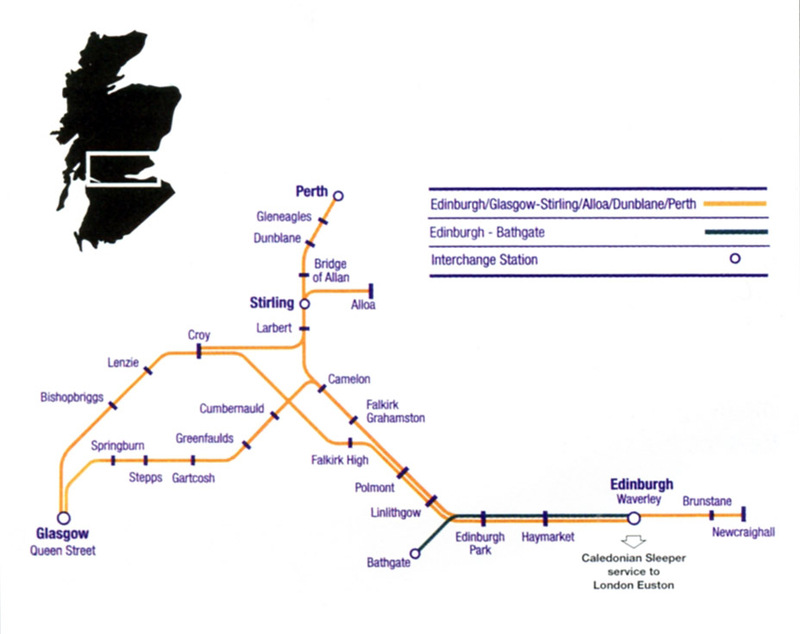 Also known as the Shoogly Train. 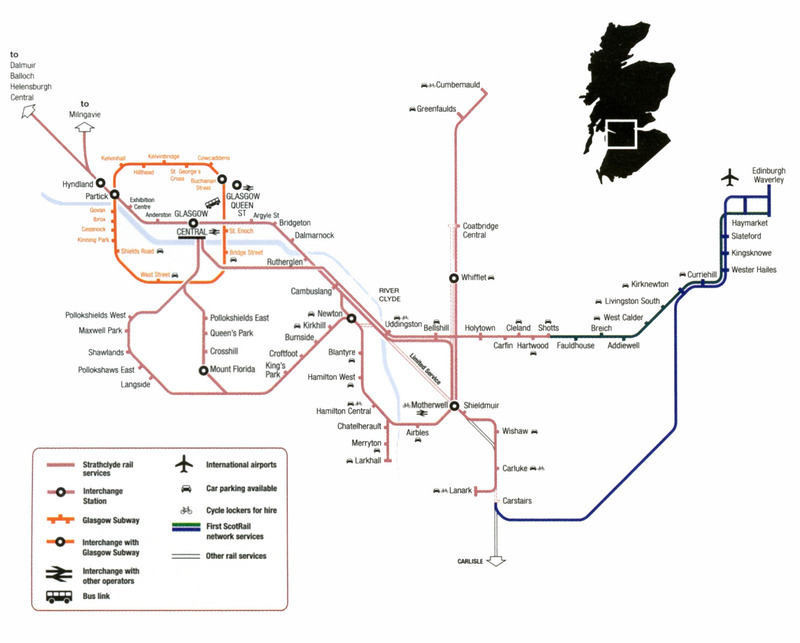 The National Rail timetable map and its disabled access offshoot are broadly similar. 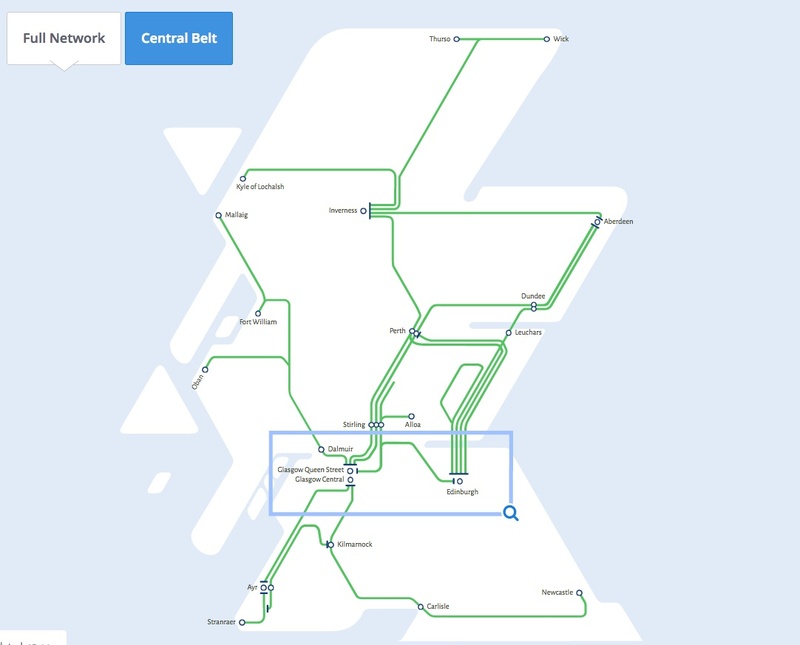 However, some effort has been made on the disabled access version to interpret the difficult Hamilton-Holytown-Motherwell-Wishaw area - the NR map makes the Lanark-Holytown-Motherwell-Hamilton service (reasonably direct in practice) look extremely circuitous. 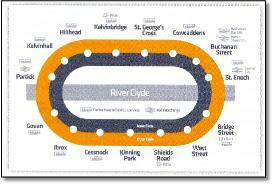 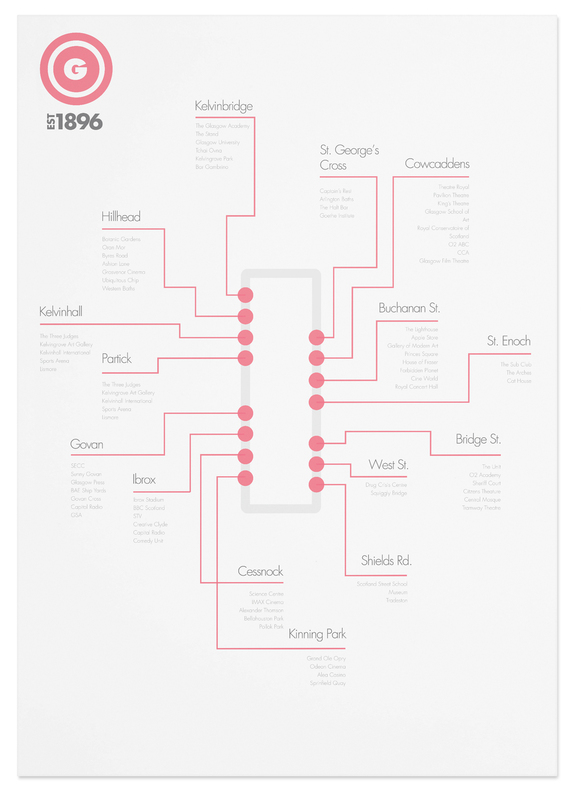 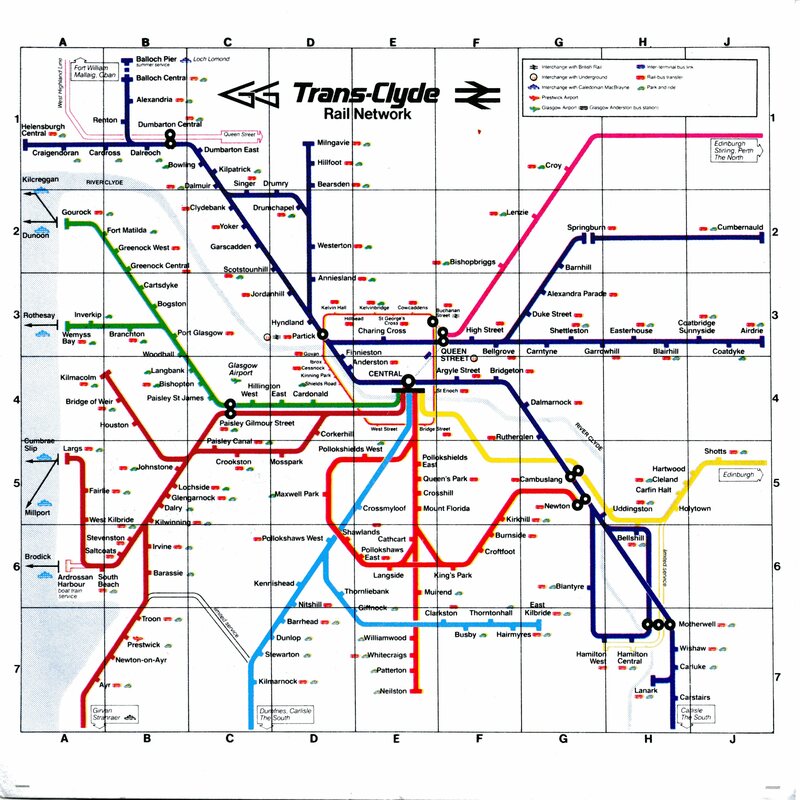 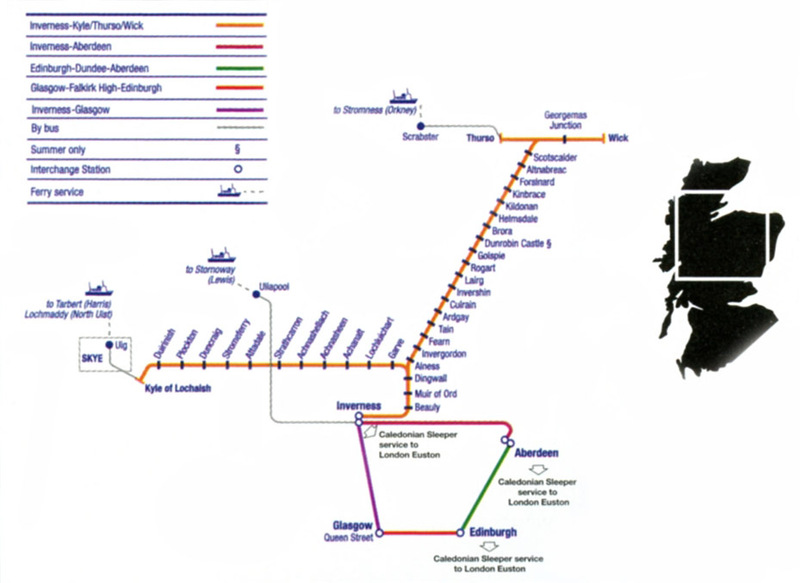 An attempt has been made to abstract all these maps from the main Scotrail map. 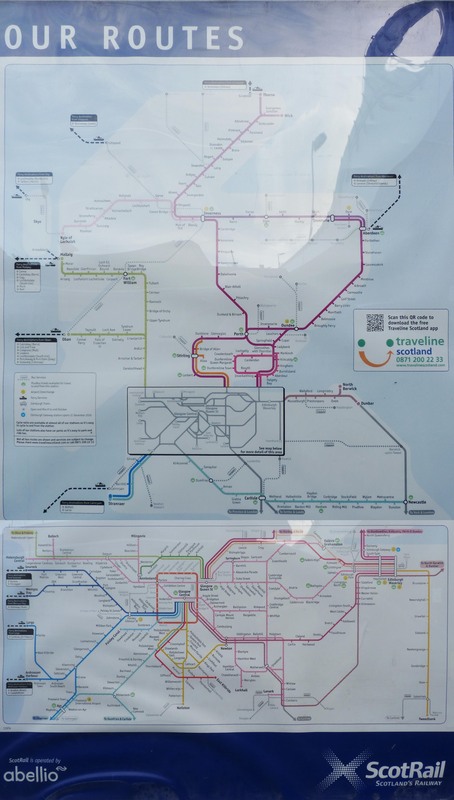 They demonstrate the difficulty in doing this as the requirements of the route maps are different to a network map, producing some graceless distortions (the Highland line map being particularly inelegant and inaccurate around Perth). 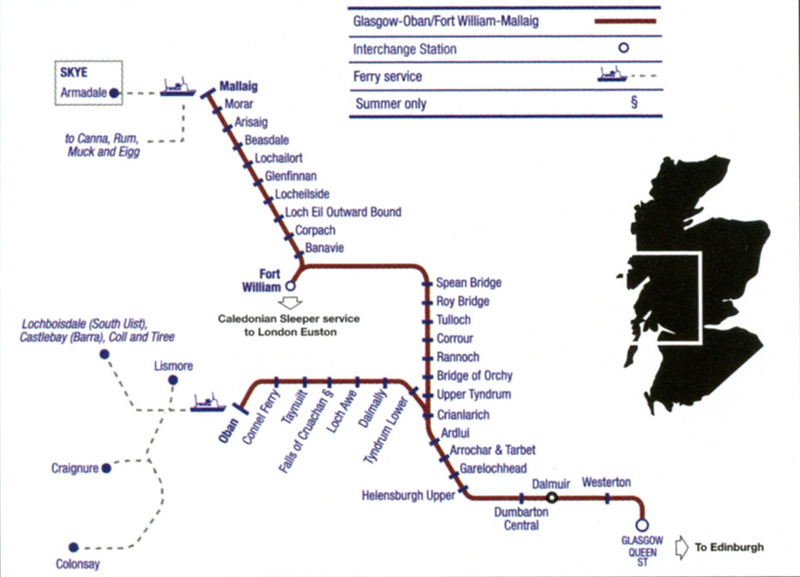 Different symbols are also applied, for example, on the Scotrail network map Mallaig and Oban are interchange stations but on the route map they're termini. 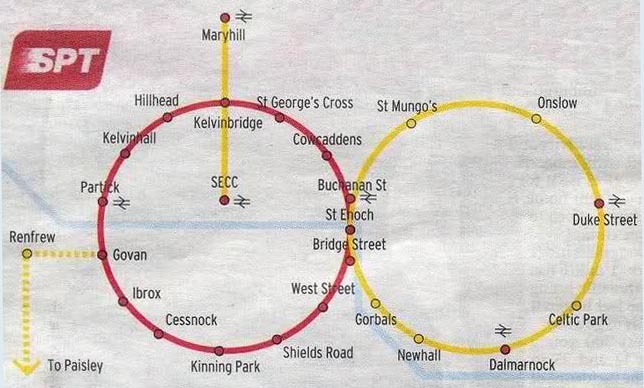 Once other lines are removed the random shapes left don't always make much sense, and Glasgow Central and Edinburgh stations look very odd after the removal of other routes but leaving the long connecting bar. 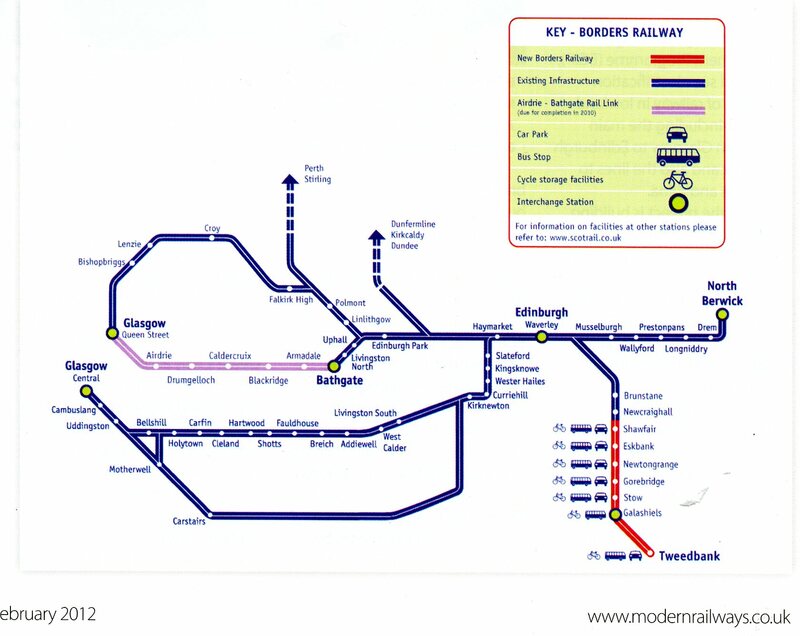 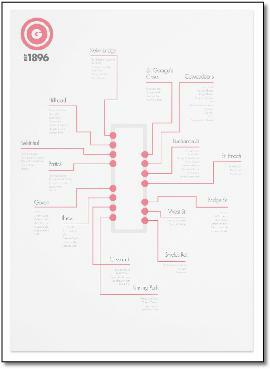 Most maps are too small, with little effort made to maximise their size in the small timetable booklets, making them unreadable. 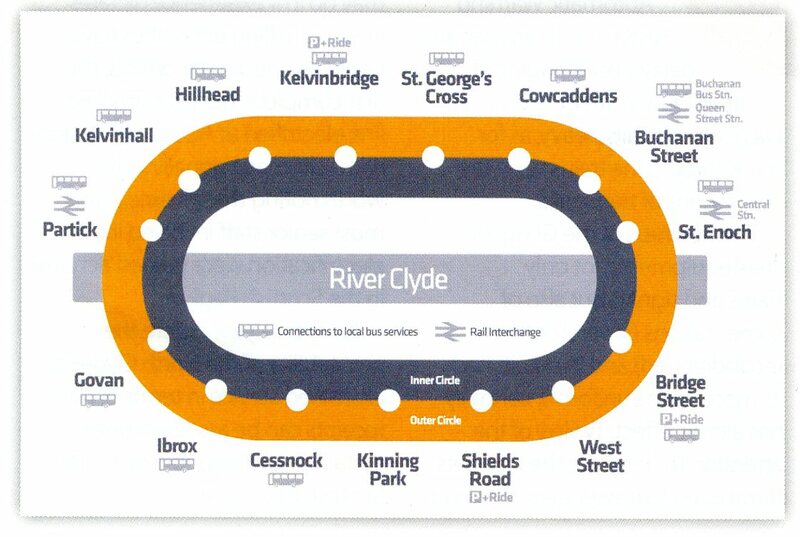 The white location rectangle on the geographic shape is often wrongly positioned and is not very visible as it disappears outside the coastline - a coloured square seems obvious. 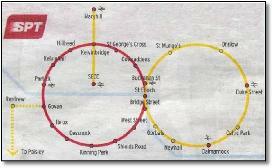 Station ticks change between line colour and blue. 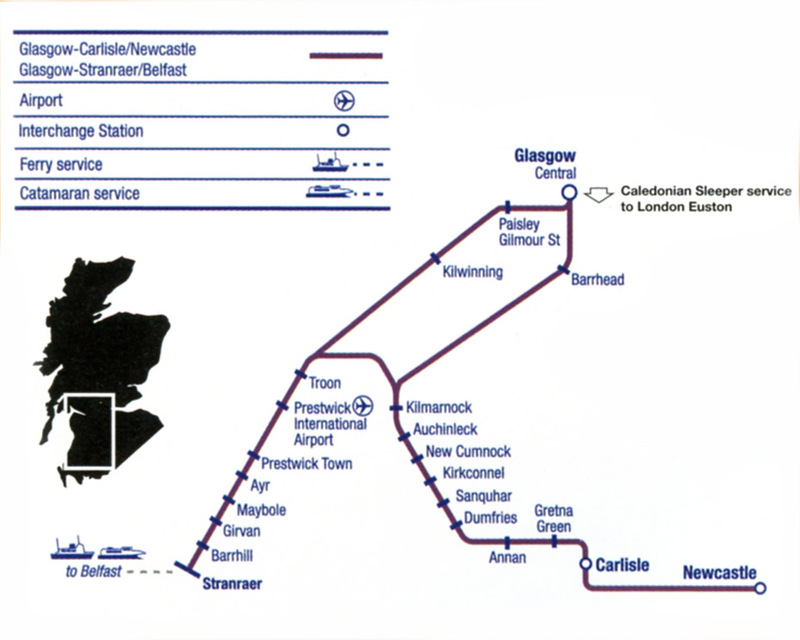 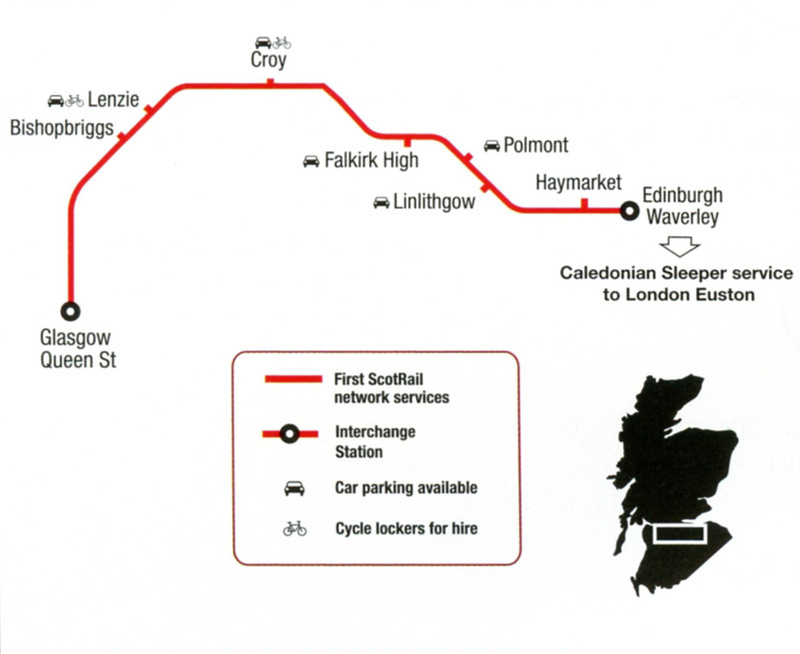 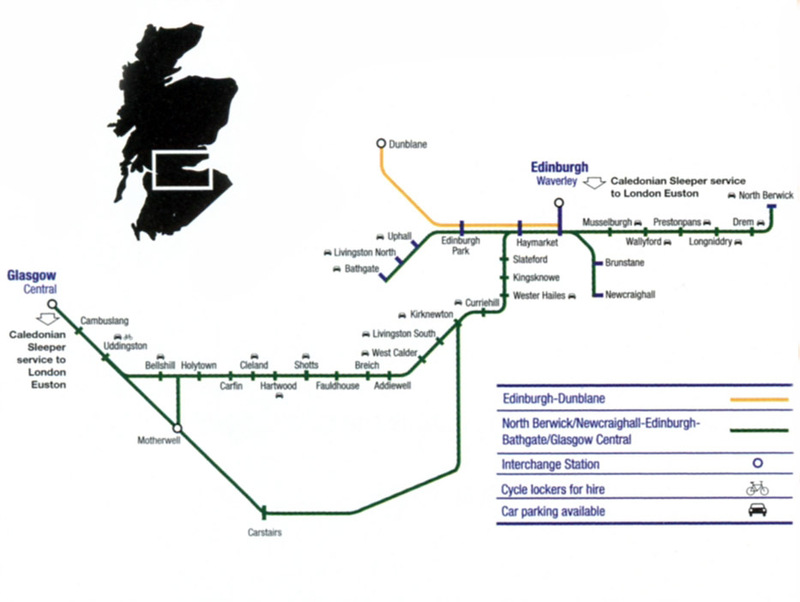 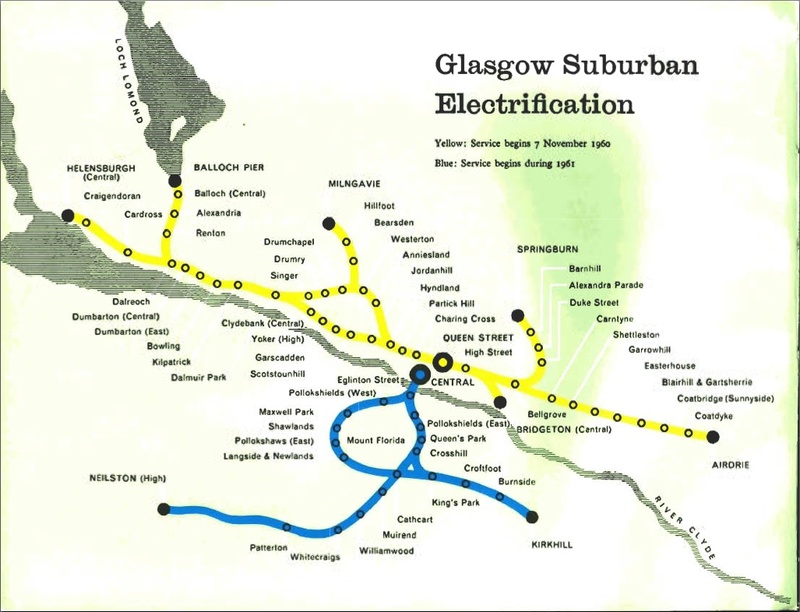 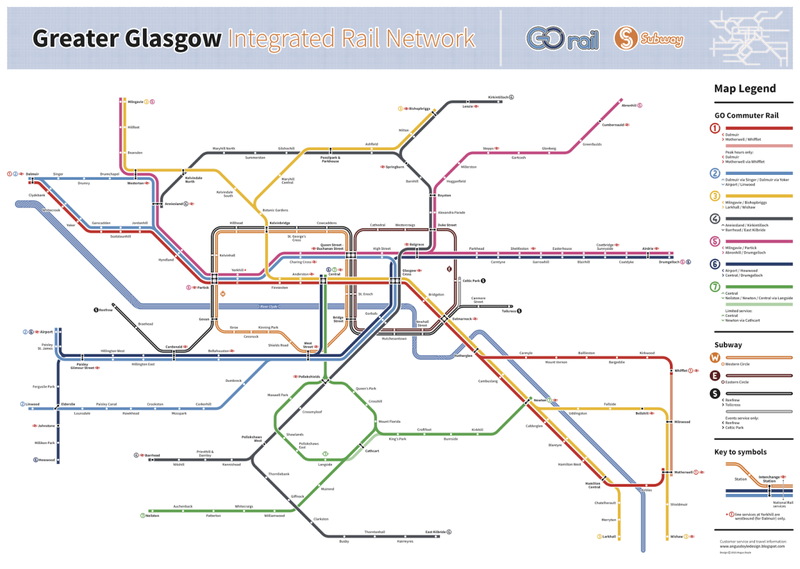 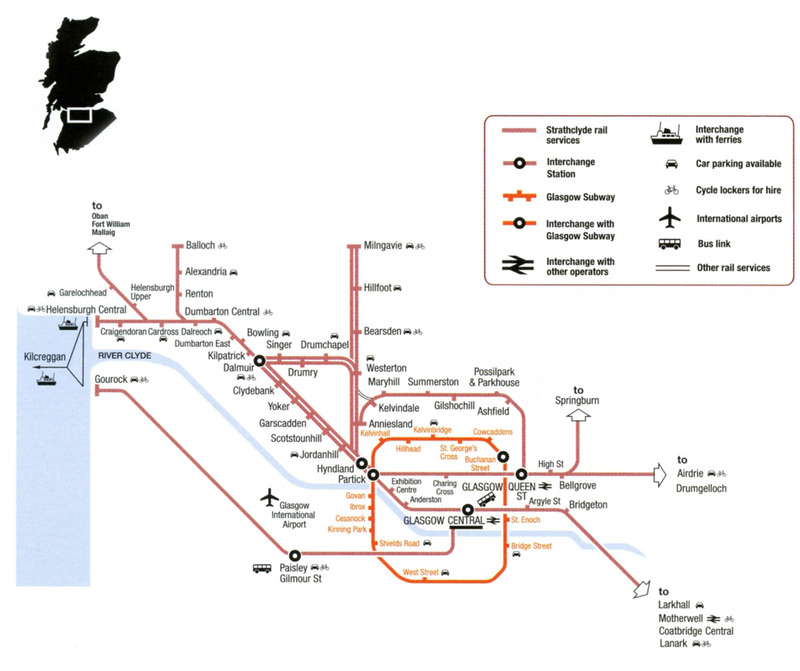 Times are given for rail and ship connecting services and for the Caledonian sleeper but the later is not shown (although shown on the network map) but referenced by a peculiar arrow suggesting some kind of unidentifiable difference.